As an experienced Fort Worth property management company we are asked a lot of questions. We love answering any question you can throw at us; it is what we’re here for! But to simplify things we’ve put together a list of FAQs for you. Read our answers below to the top 10 questions we see most often in Fort Worth residential property management. 1. What is the quickest way to get my property rented? Ensure your property is up to code and needed maintenance is completed before showing the home. Spruce up around the property to increase curb appeal. Market aggressively, especially online on multiple websites. See our post on renting out your property faster. 2. How can I keep my tenants longer? Tenant retention can be a struggle for some landlords. If you’re running into this issue, try to take a step back and place yourself in your tenant’s shoes. Are you responding to emergencies promptly? Are there maintenance issues that need to be resolved? How is your tenant-landlord relationship? 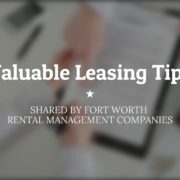 An experienced Fort Worth property management company like Specialized Property Management Fort Worth has proven processes for tenant retention so you won’t have to deal with a costly turnover as often. Read our page on high tenant turnover for more tips. 3. What strategies can I use to make rent collection less of a headache? The number one way you can make rent collection less of a headache is offering online rent payment. According to a Citigroup study, simply forgetting that a payment is due is one of the top reasons Americans pay bills late. Setting up online rent payment, with an automatic draft option, is beneficial to everyone involved. For more on this topic, read this Transunion article about the five great reasons landlords should provide online payment options. Also, you can read more about our rent collection process. 4. Legally speaking, how can I protect myself as a landlord? Take a good look at your Fort Worth property management company. Are they held to a high ethical code? When you are hiring someone to run your property, you need to know they are doing everything by the book. At Specialized Property Management Fort Worth, that is true of all our property managers. They know the laws and regulations for Fort Worth, Texas, and the United States, and take them all seriously. Also, we have in-house legal counsel at your disposal should you need them. Learn more about avoiding legal mistakes here. 5. What’s the best way to keep maintenance costs down? The number one way to reduce maintenance costs is by being proactive in both inspections and regular maintenance. Your home is a machine and needs to be checked and oiled periodically. When you neglect inspections or only inspect when tenants move out, you are in for major maintenance costs down the line. Often a small problem, like a leaky pipe, will go unnoticed until it becomes a major (and majorly expensive) issue. Regular maintenance needs, such as changing air filters, are equally important, so your home’s systems last as long as possible. At Specialized Property Management Fort Worth we inspect the home at moving time and mid-lease to ensure everything looks and works great. Read more about lowering costs on this post about cost-effective maintenance. 6. Doesn’t managing my property myself save money? To learn more about self-managing vs. hiring professional management see our post here. 7. Will paying professional management fees negatively affect my cash flow? Your professional management fees will come back to you in the form of faster leasing, less turnover, and fewer costly mistakes. Also, management fees often serve as a tax write-off. Our clients can end up with higher cash flow because our expert knowledge and service lead to cutting costs without cutting corners. Learn more about solving cash flow issues here. 8. 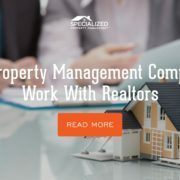 How do I know what is going on at the property if I am using a property management service? Many landlords, especially if they are renting out their previous personal residence, are concerned with what is happening at their property. At Specialized Property Management Fort Worth we never want you to feel like you’re in the dark. Our Fort Worth residential property management team keeps meticulous records of every interaction with your property and your tenants. Our online owner portal lets you see and review these reports at any time. And if you ever have questions or concerns, you can call us 24/7. 9. How do I choose a Fort Worth property manager? Decide what you want from a Fort Worth property management company before you do your research. Come up with a checklist of questions to ask potential management teams. Find out if there are any hidden costs you should be aware of. A full-service property management team will often save you the most money, time, and stress. At Specialized Property Management Fort Worth we pride ourselves on our expertise in property management, our dedication to transparency, and our customer service. To learn more, read our page about choosing a property manager. 10. With so many Fort Worth property managers out there why should I choose you? To put it simply: we are the best! Our team specializes in providing an excellent experience for owners and tenants. With years in the business focusing on single-family rental properties, you won’t find anyone else out there with the extensive knowledge, proven processes, and friendly team that will turn your investment into a cash flow property. To learn more about what we do visit our website or give us a call today to set up a free rental consultation. Realtors and property managers may seem at odds in the real estate game. A realtor’s goal is to help their client buy and sell a property while a property manager wants the property to be rented out as long as possible. After years in the rental property business we’re here to tell you that when Fort Worth residential property management companies and realtors join forces, everyone wins. As a realtor, your goal is to help your clients buy and sell real estate. Whether your client is looking for a personal residence or an investment property, your commission is based on a purchase. A client who is looking to sell, but ultimately decides to rent out their house instead, will not make you much money. And while we’re sure you want the best for every client, earning an income is also important. It is in your best interest to convince your client to sell their property. Or is it? That’s where Specialized Property Management Fort Worth comes in. Not every property management company is full-service, some focus only on a few areas. However, at Specialized Property Management Fort Worth, our team handles all the day to day tasks of running a rental property like rent collection and maintenance, as well as the once-in-a-while tasks like reporting and evictions. It is more complicated than it looks and we pride ourselves on the expertise we have gained from years of experience. We always want the best for our clients no matter what, but we understand that our job ends if our client decides to sell their property. With no property to manage we have no income, so it is in our best interest to convince them not to sell. Or is it? That’s where our Real Estate Partners come in. No matter what, we will always have clients who decide to sell, and you will have clients who decide to rent. There are choices when it comes to Fort Worth residential property management companies, so who should you refer your client to when they choose to rent out their home? With our real estate agent partnership program, we will pay you a referral fee for every client you refer who decides to sign a contract, and we place no caps on the number of clients you can refer. But the perks don’t end there. You will be placed on our realtor referral list, so when our client decides to sell, we will refer them back to you. That means when you refer a client to us you are not only gaining a referral fee, you are gaining future clients as well. We understand that when you refer a client to us, your reputation is on the line. It works the same way for us when we refer clients to you. That’s why we are focused on maintaining good working relationships with our realtors, our clients, and our tenants. We strive to be the best in Fort Worth real estate management, and we enjoy partnering with top realtors so our clients can continue receiving great service after they leave us. You can trust that your client is in good hands when you refer them to our management team. If the client ever has an emergency or a problem we are around 24/7 to take their call. No other Fort Worth real estate management company does more to ensure their clients are well taken care of. To learn more about what we do for landlords visit our landlord help page. Even if you don’t have a client who is looking to rent instead of sell, give us a call today to learn more about how you can partner with one of the top Fort Worth residential property management companies. We thank you, and so will your clients!